The kookaburra, English willow, Kashmir willow, are the different types of cricket bat which have evolved over the years. But now, Anil Kumble is all set to step up the game. The former Indian team captain and coach has introduced the concept of the ‘Power Bat’ which is a regular cricket bat with a credit card sized, sticker chip on its shoulder. Manufactured by his technology startup Spektacom Technologies, this little sticker will change the way international cricket is watched, played and learned. The sticker uses Microsoft Cognitive AI Services for Real-time transfer of data from the sticker to Spektacom App / APIs through Azure Cloud. Broadcasters, players, spectators, and coaches, the sticker has something to offer to everybody. The broadcasters can employ the real-time data for a wholly reimagined fan engagement experience with all new parameters in place. The players (both batsman and bowlers) can analyze the data for a better and improved performance and get an idea of how often did he/she hit the ‘sweet spot’. Real-time modeling of the shots will help the coaches to provide more meaningful insights to the aspiring students and we as spectators, with the help of this gadget can understand the science of batting better. The data points will majorly revolve around four parameters- the speed of the bat, swing, the power of the shot, and twist. Spektacom has already experimented with the power bat in the Tamil Nadu Premier League and is now ready to give a shot at the international grounds as well, thanks to the broadcasting partner Star Sports. The chip will calculate the quality of the shot in percentages, kmph for the speed of the bat and degrees to measure the twist. The power bat displayed impressive results in a live demonstration at the Star Sports studio in Mumbai. The processed results of the shot popped up on the screen in a matter of few seconds. Anil Kumble, the man who knocked 619 wickets in just 132 test matches has come up with an idea which fairly helps the batsman. As intriguing as this is, Kumble’s take on this settles the dust to the ground. “If you look at the game, lots of attention is on the batsman. That’s the skill you want to understand. Also, in bowling, you have a left-arm spinner, right-arm fast bowler or a right-arm swing bowler, while batting is only left or right arm. That intrigued me” he said, adding that the sticker will help the bowlers to understand the game of the batsman more in-depth and target his/her weaknesses. While the broadcasters will have access to the data in real time and later the players as well, the sticker will sooner or later be available commercially for anybody to purchase and access the data by downloading an app. The device charges in 90 minutes, lasts for 2 days, and will be affordable, Kumble said. Cricketers are often believed to be over-particular about the weight of their bat. Rahul Dravid would notice even a few grams change in the weight and also the shape of his bat. So ‘form factor’ was the most essential aspect of the gadget for Spektacom. “If it’s intrusive, you wouldn’t want to use it no matter what valuable data is thrown at you. It doesn’t change the balance or pick-up. The data that comes out will only enhance the performance and skill” – Anil Kumble. With varied versions of data collection existing in Formula one and Spanish Football League La-Liga, Spektacom believes that the sticker can be used in other sports as well. 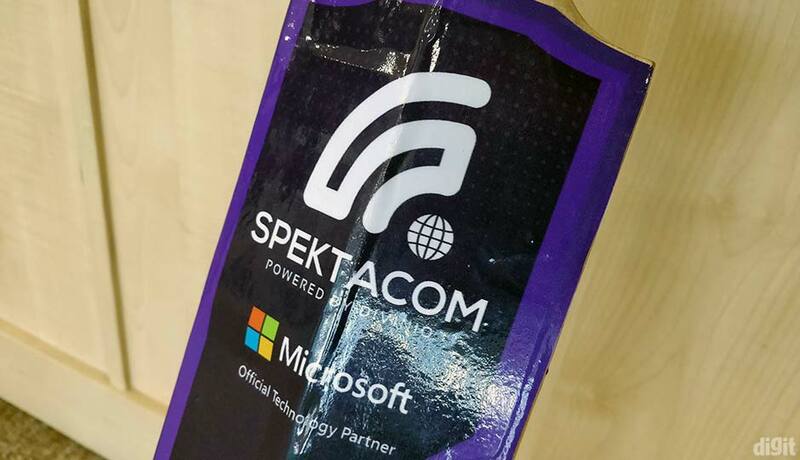 Powered Azure services, Microsoft and Spektacom joined hands when Anil Kumble met Microsoft’s CEO and a cricket enthusiast Satya Nadella at an event and within a year, the ‘Power Bat’ is in action. The former Indian cricketer who is an engineer too is well known as the first person to bring computers to the dressing-room for data analysis and ball-to-ball scoring back in 1997. Cricket has evolved leaps and bounds over the centuries, and Spektacom has arrived at the party.